I come back to the list of my favorite year’s best collections with one of the top titles. Ellen Datlow’s year’s best are always at the highest level of quality and I can’t honestly recall a collection of hers that disappointed me, even for one bit. This year, Ellen Datlow’s “The Best Horror of the Year” sees its fifth volume being released, by Night Shade Books in April, and as always the table of contents looks strong and full of memorable stories. On the note, the cover accompanying this post is not the final one. Since the final table of contents was only recently announced the names appearing on the cover are those of last year’s volume. The only thing not subject to change on the cover is the artwork. Darkness, both literal and psychological, holds its own unique fascination. 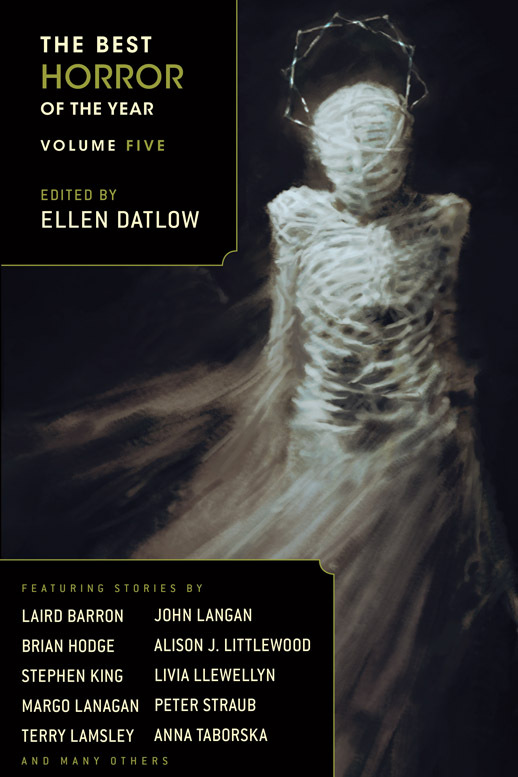 Despite our fears, or perhaps because of them, readers have always been drawn to tales of death, terror, madness, and the supernatural, and no more so than today when a wildly imaginative new generation of dark dreamers is carrying on in the tradition of Poe and Lovecraft and King, crafting exquisitely disturbing literary nightmares that gaze without flinching into the abyss—and linger in the mind long after. Multiple award-winning editor Ellen Datlow knows the darkest corners of fiction and poetry better than most. Once again, she has braved the haunted landscape of modern horror to seek out the most chilling new works by both legendary masters of the genre and fresh young talents. Here are twisted hungers and obsessions, human and otherwise, along with an unsettling variety of spine-tingling fears and fantasies. The cutting edge of horror has never cut deeper than in this comprehensive showcase of the very best the field has to offer. Enter at your own risk.